Our Chamber, like all Chambers of Commerce, is a not-for-profit advocate for local member businesses. Businesses become members because they take pride in contributing to their community. Joining the Chamber is a smart business move, as member businesses can take advantage of many networking opportunities, as well as experience increased promotion of their business through our website, e-blast, and social media. 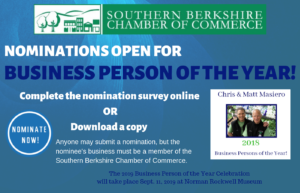 The Southern Berkshire Chamber of Commerce is managed by a volunteer Board of Directors, established to promote civic, commercial, industrial, and agricultural progress within the Southern Berkshires, and to work diligently with community partners and town officials for the establishment of sound business in our area. If you would like to learn more about joining The Southern Berkshire Chamber of Commerce, click here.